Outdoor Friendly makes your bike holiday smooth... pedalling! Discover the perfect balance between sport and leisure while looking for new trails and increasingly challenging adventures. 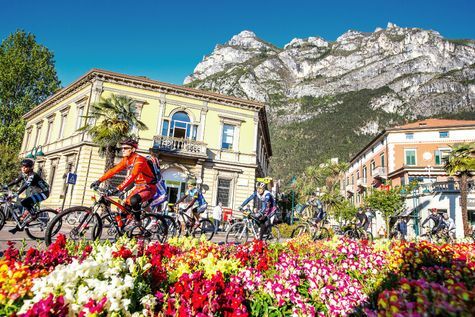 The hype is real for Bike Festival, the first great event (3 - 5 May) which opens the MTB season right in the heart of Garda Trentino! What are you waiting for? Get ready for a bike holiday with your friends: face unprecedented and thrilling challenges, ride uphill climbs reaching heights up to 4.000 meters, admire breathtaking views among the Dolomites, enjoy numerous cliff-side trails towering above the Lake Garda or simply ride immersed in nature. These are the keywords of an Outdoor Friendly holiday! Start your day off with a healthy breakfast, so you can get all the energies needed to ride on any trail, from the Ronda Extrema (91 km) to the touristic trails. And when you are done pedalling, there is only one thing left to do: go back to the hotel and relax! The staff will take care of your bike and equipment and you only need to plan the following day, choosing among thousands of kilometres.